I’d like to thank David Watson of the Ottawa Citizen for having published my and Nick MacDonald’s column, “Onley Provides Much Needed Education.” It follows up on our earlier column from October 2012, “McGuinty Had Every Right to Prorogue,” and shows how the Lieutenant Governor of Ontario, His Honour David Onley, has explained and promoted Responsible Government during the intersession of McGuinty’s prorogation (15 October 2012 to 19 February 2013). We believe — as apparently Onley does — that when a viceregal representative exercises the rare discretion to prorogue the legislature he or she should explain the decision to the public. I disagree with those statements. 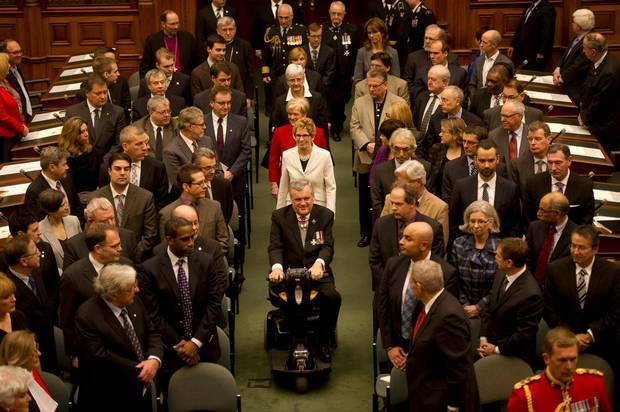 First, prorogation occurs every two years or so in Ontario, so it’s not particularly rare. Second, McGuinty’s prorogation of 2012 – including the unspecified duration of the intersession – conformed to the norm in Ontario and to the standard practice under Premiers Rae, Harris, and Eves. In addition, the legislature met more frequently and for a greater number of sitting days under the McGuinty government than under either the Rae or Harris governments. Third, the Governors do not possess the discretion to reject advice to prorogue, and Onley did not exercise any discretionary authority in this instance. Fourth, while Onley has established a new approach and implemented a new and successful media strategy, he did not explain the rationale behind McGuinty’s political decision to prorogue, and he did not break the convention of confidentiality between the governor and first minister. McGuinty explained the rationale and the political decision to prorogue the 1st session of the 40th Legislature. Onley merely explained the constitutional position on prorogation and the general constitutional relationship between the premier and first minister; more crucially, Onley did not divulge the contents of a particular consultation. This is an important distinction. Responsible Government means that Ministers of the Crown take responsibility for all acts of the Crown (including government bills, supply bills, and all executive policy decisions), and that the Lieutenant Governor acts on and in accordance with ministerial advice. Government Ministers must also defend the political neutrality of the Lieutenant Governor by assuming the political responsibility for their executive decisions, because the Lieutenant Governor cannot advocate on behalf of himself without undermining his Ministers. Responsible Government also means that the First Minister must maintain the confidence of the Governor, as well as the more commonly stated and better known principle that the Government must maintain the confidence of the lower house. The Governor expresses that confidence in the First Minister by granting him a commission of authority to govern under the Crown and by acting on and in accordance with his advice. The Governor would revoke his confidence in the First Minister and Government, under exceptional circumstances, by refusing to promulgate or acting contrary to their advice – which in turn forces either the dismissal or resignation of the Ministry. This exceptional consequence is precisely why the Governor may only act contrary to ministerial advice under exceptional circumstances. The Governor’s discretionary authority to reject ministerial advice under exceptional circumstances (the “reserve power”) truly is the nuclear deterrent of Responsible Government, though most scholars since Bourinot and Dawson have not properly acknowledged why. Responsible Government therefore requires that the consultations between the Premier and Governor remain confidential. This confidentiality does not require the strict “Sphinx-like silence” that Dodek and Sossin highlighted – it only means that neither the Premier nor the Governor may divulge the content of their consultations. The First Minister can and should explain the rationale behind his political decision, and the Governor may explain his role under Responsible Government. However, under no circumstances should the Governor explain the rationale behind acts of the Crown or issue written reasons, because this arrangement would undermine Responsible Government. If the Governor breaks the confidentiality of his consultations with the First Minister, he would undermine the position of the First Minister and indirectly revoke his commission of authority under the Crown to govern. This would probably lead to the dismissal or resignation of the incumbent government. This entire idea derives from the worst precedent in the core Commonwealth: in Australia, Governor General Sir John Kerr dismissed Prime Minister Gough Whitlam on 11 November 1975 and appointed the Opposition Leader Malcolm Fraser as Prime Minister later that afternoon because the Liberal majority in the Senate blocked the the budget of Whitlam’s majority Labor Government. (Worse still, the Whitlam government undoubtedly commanded the confidence of the House of Representatives). Kerr issued four pages of reasons why he dismissed Whitlam; by accepting Kerr’s commission to form a new government, Fraser thereby accepted Whitlam’s dismissal and the rationale behind it, and then immediately advised a double dissolution in order to break the deadlock between the two houses. This example shows how the Governor cannot issue written reasons without necessarily undermining the incumbent First Minister and Government. The First Minister – not the Governor – should issue explanations, which is what McGuinty did, even though he couched his rationale in the obfuscation of the standard Orwellian political rhetoric. As Nick and I explain in the column, McGuinty’s inadequate explanation is a political issue, not a constitutional one. That said, the inadequacy of McGuinty’s explanation indirectly exposes the true political, tactical reasons behind his decision. I’ve also posted the unabridged version of the column below. The Speech from the Throne of 19 February 2013 officially ended David McGuinty’s prorogation, started the 2nd session of the 40th Legislature of Ontario, and introduced the agenda of Kathleen Wynne’s government. Constitutional events have now come full circle since 15 October 2012, when Dalton McGuinty announced his intention to resign as both Liberal leader and Premier of Ontario, while also proroguing the legislature to an unspecified date. In an interview with Steve Paikin from 23 October 2012, McGuinty explained that the prorogation provided a “cooling off period” from an overly partisan environment, and that he had decided to “blow the whistle” because the legislature was no longer functioning “in the public interest.” But McGuinty divulged too much and needlessly dragged the Lieutenant Governor into a political debate; in so doing, he undermined David C. Onley’s position by commenting that Onley had asked “no questions” about the prorogation. Normally, the first minister refuses to discuss the contents of his consultations with the governor; McGuinty should have followed suit. In fairness, McGuinty also explained in a press conference on October 24 that only the Premier makes and takes responsibility for the political decision to prorogue. McGuinty may have prorogued in order to postpone embarrassing debates on the cancellation of gas plants and accommodate the Liberal leadership election and the mid-parliamentary change of government; his critics have found his official explanations wanting, but this is a political matter, not a constitutional one. Responsible Government, the bedrock of Canada’s and Ontario’s system of government, means that Ministers of the Crown take responsibility for all acts of the Crown; this includes government bills, supply bills, and all executive policy decisions – as well as requests to prorogue. Accordingly, the lieutenant governor acts on and in accordance with ministerial advice. As such, it is incumbent on government ministers to defend the political neutrality of the lieutenant governor by assuming the political responsibility for their executive decisions, because the lieutenant governor cannot advocate on behalf of himself without undermining his ministers. Based on McGuinty’s description of his consultations with Onley, a major Toronto daily unflatteringly referred to the Lieutenant Governor as “pliant and incurious.” This assessment presumes a political expectation that the Lieutenant Governor makes the political decision to prorogue and exercises political judgement on the matter. But the Lieutenant Governor does not possess the discretion to reject advice to prorogue. Following intense fallout from the media and the public’s misunderstanding of his position, Onley gave an interview with the Toronto Star on 13 January 2013 where stated, “The premier, not the lieutenant-governor, is responsible for the decisions.” Drawing on Bagehot’s famous trio of rights, he added that all the Lieutenant Governor may do on his “own initiative is advise and warn” ministers. But Onley did not explain the rationale behind the decision to prorogue. Instead, he explained the basis on which all of his decisions are made when being advised by the government. Only McGuinty has thus far explained the rationale behind his own decision to prorogue. While the media may not have been aware of these principles, the Lieutenant Governor’s Office has since tried to fill this knowledge gap by clarifying the public’s expectations of his role. Through a series of informative and accessible press releases and backgrounders on the transition between the McGuinty and Wynne governments, the lieutenant governor’s media strategy has helped correct some misconceptions of his constitutional role, while still maintaining the confidentiality of his consultations with the Premier. This information contributed greatly to accurate media reporting of these constitutional events. The Liberal Party of Ontario elected Kathleen Wynne as its new leader on 26 January. Onley then acknowledged Wynne as Premier-designate on 31 January and commissioned her to form a new Government. On 11 February, McGuinty formally resigned as Premier, and Onley swore in Wynne and her Cabinet as the 25th Ministry of Ontario that same afternoon. Onley then opened the new session on 19 February. The tradition of strict silence on the part of the governor has not always serve the office well, particularly in an intense media environment where constitutional conventions are not well-understood and where expectations on where to find information has shifted. But conventions evolve, and Ontario’s lieutenant governor has risen to the challenge. David Onley has established a new model of vice-regal accessibility in Ontario that includes an updated and expanded website, a strong presence on Facebook and Twitter, and issuing timely and informative press releases on his constitutional role – all while faithfully explaining and reinforcing that in our system of government, where ministers of the Crown take responsibility for all acts of the Crown. This entry was posted in Appointment of PM, Consultations, Crown (Powers and Office), Formation of Governments, Governor's Discretion, Prorogation, Reaffirmation of, Responsible Government and tagged Adam Dodek, David Onley, Lorne Sossin, Robert Macgregor Dawson, Sir John George Bourinot. Bookmark the permalink. The article by James Bowden and Nicholas Macdonald “Onley provides a needed education” (February 28) is a well intentioned but ultimately unsuccessful attempt to buoy up our beleaguered system of responsible government, the most recent example of which was Premier McGuinty’s request for prorogation in face of a contempt vote against one of his ministers. The authors claim that, as with the Harper case, the Lieutenant Governor had no discretion to refuse the request. The nub of their argument is that in responsible government “ministers of the Crown take responsibility for all acts of the Crown.” This is simply another way of saying the majority can do whatever it likes. I am sure if they reflect upon it they will admit that is a perversion of parliamentary government. Essential to our system are officials, one of whom is the Lieutenant Governor, whose responsibility is to see that we are not simply governed by the tyranny of the majority. Mr. McGuinty’s request to prorogue parliament to save a minister (and his administration) from a finding of contempt was a clear abuse of power. The sanction for abuse of power is dismissal. Had Mr. McGuinty not resigned at the same time he requested prorogation the Lieutenant Governor would have been entitled to refuse. That would have led to a defeat of the government. Mr. McGuinty, to his credit, realized that his request was a gross abuse of power and spared the Lieutenant Governor any unpleasantness by resigning. Having paid the price for abusing power there was no longer any need to refuse prorogation and, correctly, Mr. Onley did not. But imagine the new Premier follows the same tactic and asks for prorogation to avoid another motion of censure. Under the Bowden-MacDonald theory of responsible government this would be granted and presumably could be repeated for up to five years until an election would have to be called. In fact, long before that would happen, the Lieutenant Governor would refuse a request for prorogation and the House would decide the fate of the government. To argue that a Lieutenant Governor has the power to dismiss a Premier or to refuse a dissolution but not to refuse prorogation in certain circumstances is to miss the forest for the trees. It is not helping us move toward a more healthy understanding of the fundamentals of our form of parliamentary government. 2) the principle of neutrality of the Crown stems from the principle that the King can do no wrong; but the Governor clearly can do wrong for otherwise he would not be able to be RECALLED. So the Governor-General should issue reasons to explain why he did what he did (especially to the Queen), and to see whether the barometer of public opinion is on his side (some commentators have suggested the Queen might be reluctant to immediately dismiss her representative in such circumstances – particularly to defend the constitution). 3) Throughout time there are numerous examples where Governors have given reasons for their actions either to the Colonial Office, or the public, or both. So not giving reasons seems to me to be the exception, rather than the rule. 4) it is asserted “the Governors do not possess the discretion to reject advice to prorogue” but later you appear to refer to “exceptional circumstances” – there are numerous examples in the Pacific (with Westminster Parliaments), in the Australian states and India (which, while a Republic, replicates responsible government) where Governor-Generals’ or State Governors have rejected advice to prorogue Parliament or unilaterally summoned Parliament without Ministerial advice. This usually occurs where: (i) the Head of Government concedes they “probably” or “definitely” have lost confidence and want to latch onto power and need to “buy time” to restore it which back door bribes; (ii) the Parliament has been prorogued for sometime but the government is about to pursue policies which are patently illegal or unpopular, and asks for an extension of the prorogation period; (iii) there is overwhelming evidence the government has lost a majority (two thirds of the Parliament signing a petition to this effect). Situations (i) and (ii) have been upheld by the courts as activating the reserve powers. So I am not persuaded that there is no “reserve power” for prorogation and I would argue the use of the reserve power upholds the fundamental reason we have responsible government in such circumstances: that the government should confront its accusers after the deed has been done; Parliament should not simply be summoned during good times, but bad times as well. We already had one revolution against rogue monarchs who used prorogation to cut debate and criticism via prorogations. Perhaps we need a second. In any event, as you know, my view is that the Bavarian, Austrian and Swiss systems are far superior precisely because they have down away with responsible government and have adopted Democracy instead (the people at large can veto legislation, summon Parliament, dissolve Parliament and so forth). Reblogged this on not so private history.